605 County Rd. 39, Southampton, NY 11968. 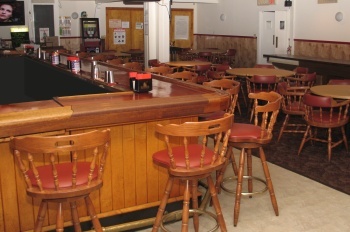 Our Lodge's bar/"Tap Room" opens at 3 p.m. daily (except open at noon on Sunday) and in addition to serving beverages to Elks members and their guests at our antique mahogany and maple bar, is capable of seating approximately 60 people (at a variety of circular and oblong tables seating 4 to 8), and 15 at the bar. Its shuffleboard table is converted to a buffet serving table for some lodge affairs. Our very popular "Monday Night Dinners" are served to Elks and guests here (limited seating, advance reservations required), with varied (single entree) fare from homestyle to gourmet served most Mondays. It has four TVs! See "News" and "Coming Dinners" on this website or call (631) 283-1574 for menu and reservations after 3 p.m. (or after noon on Sunday). 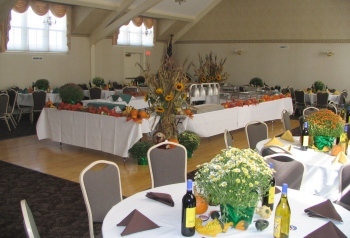 Our larger room for parties and affairs, it has been attractively redecorated, seats approximately 120 comfortably and has a large dance floor (this picture shows a square buffet area on dance floor). Custom lighting control (including a large crystal chandellier and crystal wall sconces) allows its mood to be altered as desired. Room for a band with up to 6 pieces. 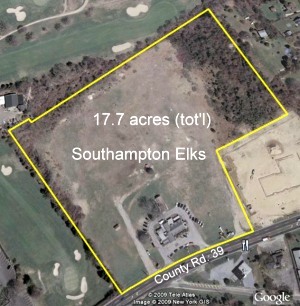 Southampton Elks has approximately 13 acres of property adjacent the Lodge and fronting on Rte. 27/County Rd. 39 (the main thoroughfare through the Hamptons) which is available for rental (exterior grounds only). It has been used for carnivals, 3-ring circuses, fairs, outdoor expos, auctions, concerts, antique shows, art shows and fundraising events; there is sufficient space for parking hundreds of cars. NOTE: for public events, our Town requires issuance of a permit, applications for which must be submitted at least 90 days prior to the event, so advance planning is necessary. Rental is subject to availability. The permit application must detail types of tents, sanitary and other facilities, have a traffic control plan, etc. We also have a complete outdoor BBQ cooking area (the cooking area is roofed and can be almost entirely enclosed), used for our Lodge's renowned "Lobster Bake" in August, our Pig Roast in September, and other outdoor lodge events. Call the lodge for further information. Unfortunately, we are not permitted to supply RV hookups.